The year 2000 was an eventful one for The Phantom community. Egmont Publications in Sweden celebrated the 50th anniversary of their Fantomen magazine, and also cemented a contract with King Features to continue supplying new scripts for the Phantom newspaper strips into the foreseeable future. Egmont has recently taken an interest in expanding into Asia -- enter Indian Express Egmont Publications and their new Indian Phantom comic launched in June. Sadly, it wasn't all roses for Egmont -- veteran artist Jaime Vallvé died at the age of 73. Over in The Phantom's birthplace, the USA, Moonstone Comics signed contracts to produce a new series of quarterly Phantom comics starting in early 2001. Graham Nolan succeeded George Olesen and Fred Fredericks as the artist for the Phantom Sundays. And meanwhile in Australia ... it was business as usual at Frew, supported by a reader competition to win a one year subscription to The Phantom comic book. Frew published 31 editions of The Phantom in 2000, with a total count of 1788 pages - the lowest in 5 years. The net cover price for an annual supply of Frew Phantom comics has continued to rise slightly, this time due to the introduction of a Goods and Services Tax (GST) on 1 July 2000. The price of the standard 36 page issue has now risen from $1.75 to $1.92, and likewise all other larger issues have increased by 10%. Even so, the average price per page still remains below 1988-90 levels. 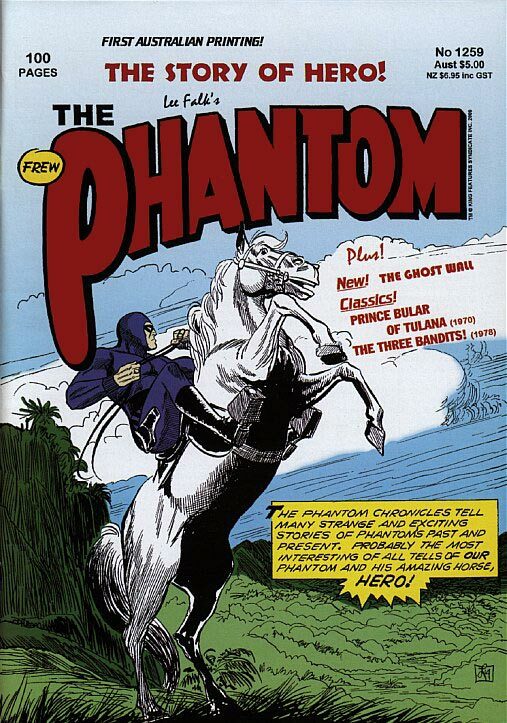 Frew's The Phantom is still the lowest priced comic book on the Australian market. A detailed breakdown of the size, price and number of issues published in 2000 is shown below, in comparison with the last five years. Frew published a total of 50 Phantom stories this year. As usual, the Lee Falk classics deserve first mention - refer the table below for a complete list of the newspaper strip stories printed in 2000. Since 1988, the prime factor influencing Frew's decision to bring back an old newspaper strip story was the length of time it had been out of print. A fantastic opportunity for newcomers to read wonderful stories from the archives. However, in the year 2000 only 8 of the 18 reconstructed newspaper strip stories met this criteria. The other 10 stories were Ray Moore classics dating from 1937-43 that had already been reprinted in complete form less than 11 years ago. These stories are considered to be the most popular amongst Frew's readers and hence they were selected for a special Lee Falk tribute Annual Special. Yet this change in policy has meant that we will need to wait a little longer to see complete reprints of the remaining stories that have been out of print for even longer. The 19 Lee Falk stories reprinted in 2000 (including the remake of The Wharf Rats ), were spread out over 8 issues and represented only 38% of the total number of stories published -- this is the lowest representation since 1990! Hopefully this is only a glitch after a particularly generous 1999 and not a sign of the future. This statistic is also influenced by the fact that the 5 new daily stories published by Frew were written by Tony De Paul or Claes Reimerthi, and no longer by Lee Falk. During 2000, Frew printed 24 new stories originally published by Egmont, Scandinavia. These were divided into 10 single-part stories, 5 two-part stories, and ... perhaps the most popular amongst Frew readers ... the four-part Spear of Destiny by Ben Raab and Joan Boix. All of Egmont's new feature stories from issue Nr.1/2000 through to Nr.23/2000 plus Nr.26/2000 were reproduced in Frew's Phantom comic. Full details of the publishing schedule are available here. Claes Reimerthi was once again the most prolific of the Egmont writers, but far less dramatically; he contributed 5 stories this year compared with 13 in 1999. This is probably in response to the extra workload he shares with Tony De Paul, providing scripts for The Phantom newspaper strips. The writing duties at Egmont were spread around eight other writers, including the débutante Dag Reiner Frognes from Norway who wrote the two-part Zombie Maker story that unfortunately suffered from a continuity flaw in the artwork (the heroine of the story changed from white- to black-skinned between the two parts -- a subtle change in Frew's black & white comics but blatantly obvious in the coloured Egmont editions). Illustration was ably supplied by the highly experienced team of Phantom artists, including the return of Kari Leppänen who first drew The Phantom 22 years ago. Romano Felmang and his team of assistants were the most prolific artists, including two resurrected Lee Falk classics - Tiger Girl and Queen Pera - with superb inking assistance from Germano Ferri. My vote for Egmont's best story in 2000 goes to the two-part The 22nd Phantom by Hans Lindahl - a fascinating preview of future developments, with the twins playing an increasingly important role - closely followed by Viva Las Vegas by De Paul and Spadari. Spadari's artwork is always something to watch out for, especially when coupled with a quirky script from Tony De Paul. A summary of the statistics for all Egmont writers and artists is shown below. That makes a total of 48 stories. The remaining two of the total count were reprints of 1967 vintage Bill Lignante stories from the American King Comics. The feature story The Story of Hero presented an alternative take on the origin of Hero (first told in The Maharajah's Daughter in 1944/45 dailies, Frew #1203). The other was a rare 4-page Phantom story from the Mandrake comics that were published during the same era. Both were a special treat for "those who came in late" ... especially as they had never been seen in an Australian comic. Last but not least ... the covers. Jim Shepherd continues to take on more and more of the cover art duty. I'm sure Jim would freely admit that he's not really an artist, and his covers always make judicious use of panels from the stories with only minor touch-ups. Antonio Lemos (7) and "Tessa" (5) were the next most prolific Frew cover artists this year. Glenn Ford only managed 2 covers but his rendition for #1274 The Phantom Goes To War was ranked the most popular cover according to Frew's records (but why, I ask you, did he plaster an American flag all over it?). My pick for the best cover of the year goes to #1259 which was credited to Bill Lignante despite bearing the hallmarks of a Jim Shepherd construction.